This is a 3 Leches with a twist... provided by the spiked Eggnog addition to the 3 leches of the syrup. 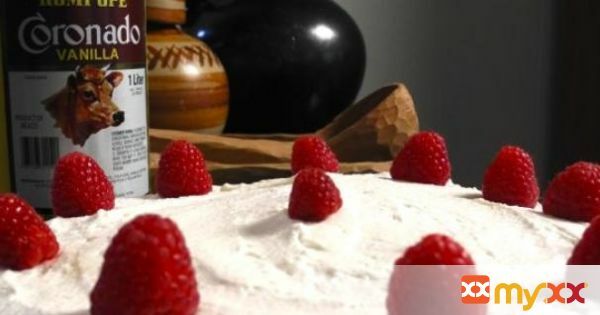 This recipe needs 40 minutes to prepare thee cake and syrup, 30 minutes in the oven, 2 hours of chilling, 10 minutes to make the whipped cream and 20 minutes to decorate. 2. In a big bowl pour the Rompope Coronado, evaporated milk and half and half, stirring to incorporate all the ingredients. 3. Pour half the liquid into a medium-sized sauce pan, then heat over hi heat occasionally stirring, until it is about to boil. 4. Reduce the heat to medium and continue cooking, stirring every now and then, until the liquid is reduced to one cup. 5. Pour the reduced liquid back into the original liquid mix, stirring to mix well, and let it cool. 7. Grease and flour lightly a 9 inch cake pan and preheat the oven at 350˚F, with the rack in the middle rung. 8. Whisk the egg yolks with the sugar until they turn fluffy and pale yellow. 9. Add the half tsp of vanilla. 10. In a separate grease-free bowl beat the egg whites with the pinch of salt with an electric mixer until the foam forms soft peaks. 11. Add the two TBS of sugar and whisk for 20 seconds more or until the foam turns glossy. 12. Pour a third of the egg white foam into the bowl with the whisked egg yolks and carefully fold it in, to avoid loosing the volume. 13. Sift 1/4 cup of flour over the mixture and continue folding it in carefully. 14. Repeat, folding in egg whites and flour until the last of the flour is incorporated. 15. When the last of the flour is almost incorporated in the mixture, add the melted butter and fold it in, carefully working to not lose the volume. 16. Pour the mixture into the prepared cake pan and bake for 30 minutes, or until the sides of cake begin to pull away from the pan. 17. Let the cake cool off slightly in the pan, then un-mold onto the plate where you will serve the cake. Bare in mind that the syrup will pool at the sides of such plate, so make sure you have enough room. 18. Poke several holes into the cake with a toothpick or the tines of a fork, to allow the cake to thoroughly absorb the 3 Leches syrup. 19. With the cake still warm and the syrup at room temperature, spoon the liquid over the cake, making sure the cake is absorbing the liquid well. 20. Once the syrup starts pooling on the sides of the serving dish, wait for 10 minutes and make sure the cake will not absorb any more liquid. 21. Wrap the cake with plastic and chill in the refrigerator for at least a couple of hours. 23. Using an electric mixer, whip the heavy cream until it forms soft peaks. 24. Add the cream of tartar to stabilize, 2 TBS of sugar and a dash of vanilla. 25. Whip until the mixture almost resembles soft butter. 26. Using circular movements from the center out, spread the whipped cream over the chilled until it is fully covered. 27. Decorate using fresh berries or the fruit of your choice.